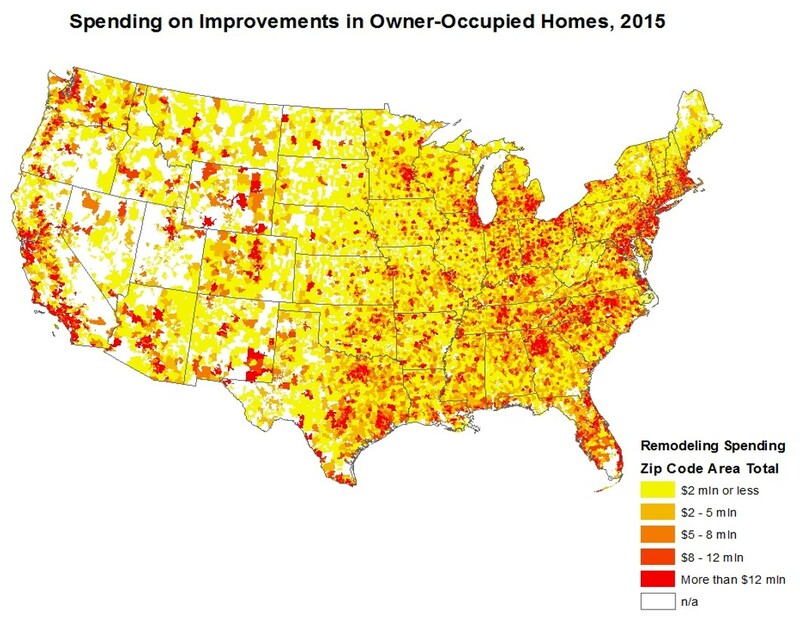 NAHB has released estimates of spending on improvements to owner-occupied housing by zip code. The estimates are based on a model relating improvement spending to five key variables (number of homes in the area, the share built in 1960s, share built in the 1970s, owners’ average income and level of education) for calendar year 2015. The estimates show total spending on improvements, as well as improvements per occupied home in the area, in each zip code. The zip code with the highest total spending on improvements is in Maryland; and the next four are in Texas. 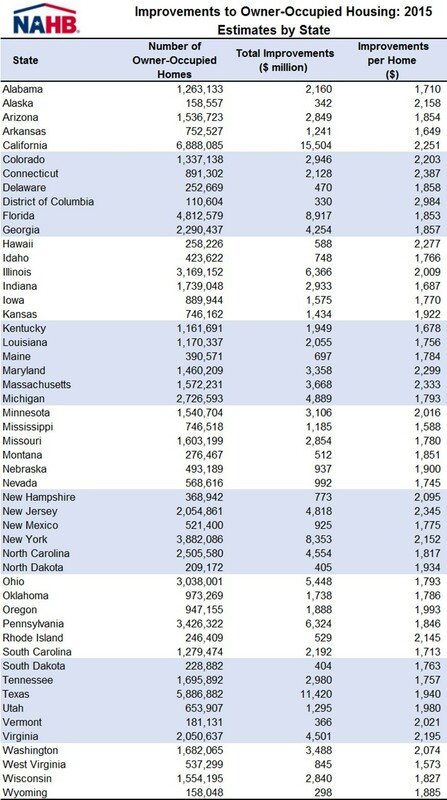 The four Texas zips have at least 20,000 owner-occupied homes; and the one in Maryland has over 15,000 (compared to the median of 1,362). Only zip codes in large metropolitan areas are likely to contain that many homes. The one in Maryland is a close-in suburb of Washington DC. Three of the Texas zip codes are in the Houston metro area; the other in Dallas-Fort Worth. In addition to a large-number of homes, these five zip codes are also characterized by college educated home owners with above-average incomes. This is particularly true for the zip code in Maryland, which also has a large share of homes in the key vintage for remodeling: 1960-1979. The improvement spending projections for 2014 are based on a statistical model developed by NAHB economists using data from the HUD/Census Bureau American Housing Survey and Census Bureau data for its approximation of zip-code area boundaries from the American Community Survey. NAHB’s 2015 estimates of home improvement spending in more than 25,000 zip codes spanning the entire country are available for sale on NAHB’s web site. Estimates aggregated to the state level are available free to NAHB Remodelers members and for a discounted price for NAHB members. Some of this information is shown below. You can also learn about joining NAHB Remodelers here.